The men of Lambda-Upsilon raise over $2,000 for St. Jude Children's Research Hospital. Throughout the month of September, the Fraters of Lambda-Upsilon challenged themselves to raise $2,000 for the kids of St. Jude Children's Research Hospital for Childhood Cancer Awareness Month. By creating and sharing personal fundraising links with friends and family, sponsoring a raffle on campus, and hosting a dunk tank on campus, Lambda-Upsilon reached and exceeded their goal by raising over $3,000 for St. Jude Children's Research Hospital. Lambda-Upsilon ended the successful week with a TKE Day of Service, benefiting Fostering Bulloch, a local organization that supports and aids children in foster care and marginal living situations. 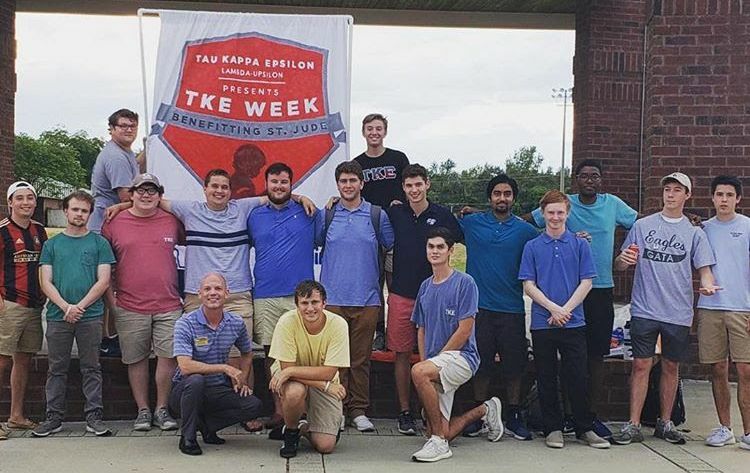 Describe by one Frater as "an event that brought the entire chapter together," the Lambda-Upsilon chapter of TKE looks to bring back the annual TKE Week bigger and better than ever before by increasing participation throughout the Statesboro and GSU community. If you would like to contribute to the cause, please visit fundraising.stjude.org/goto/GSUTKEWeek2018. All donations are secure.